You'll find us at the Midland Farmer's Market during the summer as we have product to offer for sale. In addition or our meats and farm fresh chicken and duck eggs, we offer honey in 1 and 2 lb containers and locally produced maple syrup. We look forward to the market this 2019! Our offering from the Midland Farmer's Market in ready for the start of the market on May 4, 2019. Wednesdays and Saturdays are 7 to 1p.m. We have a wide variety of USDA processed goat and lamb meats that our customers have enjoyed for years. We are thankful for the many repeat customers and the friendships we have developed in our community. 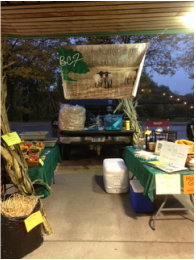 Customers are always welcome at the farm to buy farm fresh chicken and duck eggs all year long. Stop by for your all natural products today. Spring lamb is available in April through December. Contact us for pricing and to get on the list for orders. Lamb sells in halves and whole quantities, but if you have a specific need (i.e. leg of lamb), we may have some available from our own yield. It sells fast! Meat products can be custom processed at select butcher shops or USDA processing facilities.